Whether you’re looking for that special commercial property to add to your investment portfolio or a well located workshop to set up your own business – you simply can’t miss this high profile auction. H&N Perry are proud to offer 108 Park Road, Mandurah for sale via public auction. The property consists of a massive 1080m2 factory/warehouse that can be used as one large operation or divided into two leaseholds with separate factory space, offices, parking and ablutions. Situated on a 3,237m2 site, the building offers heavy vehicle high truss access, generous power supply, reception rooms and parking. It would suit a wide variety of commercial uses. When it comes to location, this property is plum in the middle of Mandurah’s busy industrial area. Park Road is an important arterial road that connects Mandurah’s residential area through to a range of local businesses and this building is situated close to the entrance of busy Mandurah Road. In an area surrounded by high profile retailers and industrial operations, the value of this location can only go up. Make no mistake, this property will sell at auction – that’s if it doesn’t sell beforehand! 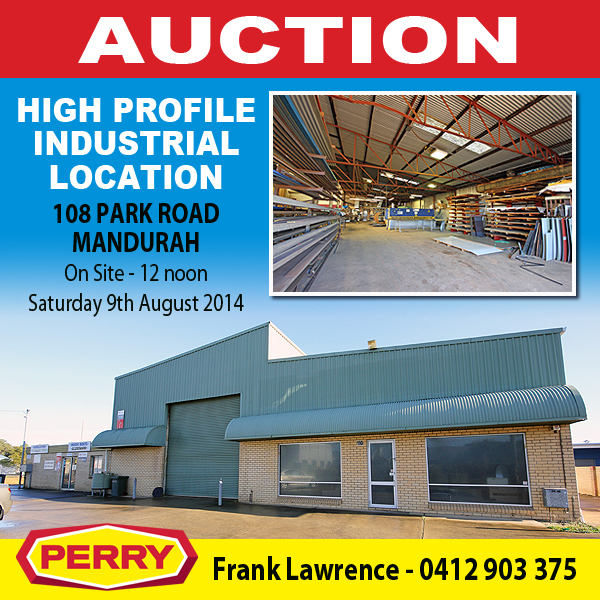 The auction will take place on site at 12noon, Saturday 9th August 2014. If you don’t want to miss out call Frank Lawrence today on 0412 903 375.